Today that might seem like an odd choice of words, since much of the buildup surrounding Jurassic Park had nothing to do with mechanical lizards. It was all about the revolutionary use of computer-generated imagery to populate Spielberg’s adaptation of the Michael Crichton novel—about a would-be nature park full of genetically re-created prehistoric creatures—with dinosaurs. It wouldn’t be the first showcase use of such technology, since James Cameron had beaten him to the punch a couple of years earlier with Terminator 2’s liquid-metal T1000. But it was widely considered a new evolution in the Hollywood blockbuster’s ability to dazzle audiences with things it never could have showed us before. And Jurassic Park was gonna need it. Like the book from which it came, the movie would have to be propulsively action-driven just to get past the techno-babble of dino-blood extracted from amber-encased mosquitoes that set up the premise. The movie in particular would also have to overcome the distracting characterization of paleobotanist Dr. Ellie Sattler (Laura Dern)—who swings wildly between competent scientist, finger-wagging feminist and “what, little ol’ me know anything about chaos theory?” bimbo—and the pairing of paleontologist Alan Grant (Sam Neill) with the grandchildren of park operator John Hammond (Richard Attenborough) so that the child-averse Grant could learn an important lesson in paternal care. But while this week’s 3-D re-release of Jurassic Park could have proven merely a historical curiosity from an era when this particular wizardry was still a novelty, rather than de rigueur, it actually offers a fascinating reminder of what distinguishes it from more recent CGI-driven adventures. 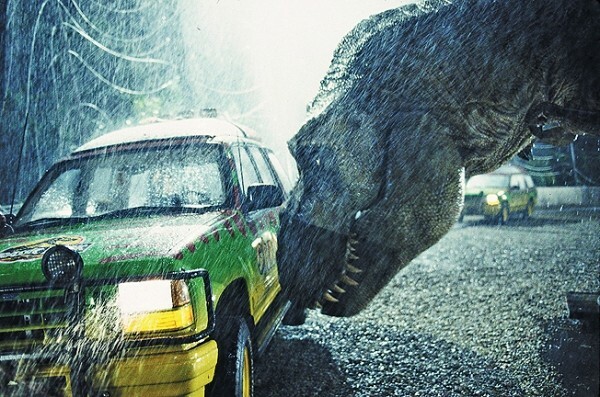 Because while Jurassic Park may be memorable for its mainframe-created gallimimus herd, or the Tyrannosaurus rex that chases down our heroes in their car, it was full of practical effects. The ailing triceratops the scientists encounter in the park, the dilophosaurus that attacks the park’s turncoat programmer Dennis Nedry (Wayne Knight), the brachiosaurus that feeds near Grant and the kids—even several shots of the T. rex and velociraptors—all involved animatronic versions designed by veteran Stan Winston (the original Terminator, Aliens), not digital creations. Watching Jurassic Park in 3-D heightens the sense of what that real-world tactility contributed to the film. The digital dinosaurs were extensions of the animatronic versions—doing the things it wasn’t possible to have a robot do—but it was the existence of the animatronic versions that heightened the sense that they were real. Anyone who has seen the “special edition” E.T. footage of the titular creature CGI’d into a bathtub, or wondered what happened to Frank Oz’s puppeteered Yoda in the Star Wars prequels, understands the difference between a special effect that feels like a genuine inhabitant of the movie’s world, and a special effect that’s impressive but somehow false. For this transitional moment, it was necessary to cling to some of the past of special effects in order to enable the movie’s future. So, yes, Jurassic Park is often silly whenever its characters open their mouths and spout nonsense about Unix systems, and its final hour of nearly nonstop running is at times just as exhausting as it is exciting. And we’re still allowed to wonder how that barrier the T. rex strides over suddenly becomes a vertiginous drop when the car goes over the edge. The movie has also still got some terrifically effective set pieces, and even 20 years later somehow seems wondrous when John Williams’ swelling score introduces us to this wildest of wild animal parks. Part of that wonder comes from realizing that the film wasn’t a phenomenon only thanks to the state-of-the-art stuff, but also thanks to way we were able to accept it—in part because of those big mechanical lizards.